A couple of weeks after the Japanese bombed Pearl Harbor launching the United States into World War II, Francis Cynkar of Maple Leaf Estates, Port Charlotte, Fla. joined the Navy. He was 15. “Four of us went down to the recruiting office. Three of us were under age, but we got the necessary papers and I forged my mother’s name. When we returned to the recruiters it was two weeks after Pearl Harbor and the office was in bedlam. Everyone wanted to sign up for the service. I think that’s how I slipped in at 15. Four months later Cynkar and the Vincennes were part of the battle group that sailed out of Pearl headed for the Japanese coast. Their target: Lt. Col. Jimmy Doolittle and his 16 B-25 Mitchell attack bombers flew off the carrier Hornet to attack the Empire of Japan. The damage the Doolittle Raiders did to the enemy was slight, but the psychological effect on he Japanese was huge. They thought they were untouchable from Allied attack at that point, but they found out they weren’t. “The problem on the Doolittle Raid was our battle group ran into a Japanese fishing boat 800 miles off the coast of Japan. The trawler disclosed the whereabouts of the U.S. ships before we sank her. After the bombers flew off the battle group headed for Midway, it was June 1942. Cynkar and the sailors aboard the heavy cruiser didn’t know it at the time, but they were about to participate in an engagement that would turn the tide of war in America’s favor in the Pacific. The Japanese lost four aircraft carriers to the U.S. Navy at Midway and never regained its dominance in the Pacific. “The carrier USS Yorktown was hit by Japanese bombs at Midway. The Vincennes was sent over to help her out,” he said. “I saw a Jap Betty bomber fly right over where I was. After that there was a big reddish-brown explosion aboard the Yorktown. “The carrier was listing and turning at the same time. That was about the time they started abandoning the Yorktown. “She was dead in the water when another American ship began towing the damaged carrier. It was while she was under tow she was struck by a Japanese torpedo and eventually sank. The Vincennes survived the epic battle unscathed. The Battle of Guadalcanal was next for the sailors aboard the cruiser. “We rendezvoused with a bunch of troop transports and escorted them to Guadalcanal. These Marines were sent ashore to capture the partially-built Japanese runway under construction on the island,” Cynkar explained. Early on the Vincennes and two other cruisers, the Quincy and the Astoria, were all attacked by Betty Bombers in Tulagi Harbor off Guadalcanal on Aug. 9, 1942. “While I was in the Sky Loft an enemy bomber flew over. It was no more than 15 feet above me. I could see the bombardier in the Plexiglas nose of the Betty,” he said. “The scuttlebutt was that a Japanese fleet had left Rabaul headed our way. They were supposed to arrive about midnight. They were late. “I was headed for my battle station when I saw this parachute flare dropping. Then all of a sudden a searchlight illuminated our ship,” Cynkar said. “About a mile away from us a Japanese ship opened up on us. The enemy was hitting us amidship with everything they had. I thought I was going to die. 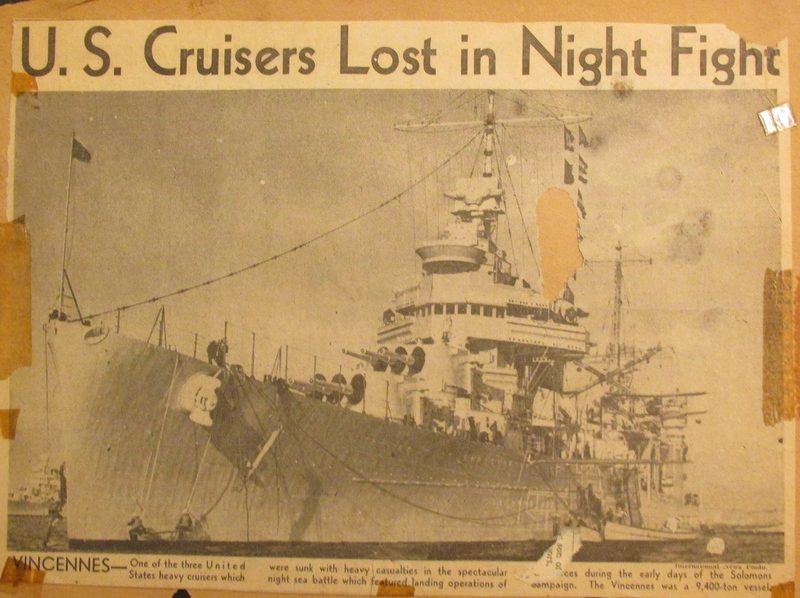 “The cruiser was shot full of holes and about to sink. They caught us dead in the water. We weren’t ready for the enemy attack. We were listing and sinking at the same time. “I climbed down a ladder from the loft to the boat deck. I had my right arm wrapped around a stanchion. While I looked down I could see it was badly burned at the elbow and the bone inside was damaged. “There was another explosion aboard ship and I found myself on the fantail. I don’t know how I got there. A lieutenant was passing out life jackets. He had a medical kit and bandaged my arm. “A buddy and I jumped over the side and landed in the sea about eight feet below. We found a piece of flotsam to cling to for an hour until some guys in a life-raft pulled us aboard. Of the 952 sailors aboard the Vincennes, 332 were killed in the fighting that night and another 258 wounded. The Japanese also sent the Astoria and the Quincy to the bottom during the same engagement. However, the enemy failed to accomplish its objective–sinking the troop transports bringing thousands of Marines to Guadalcanal. Six months later the Leathernecks captured the island and finished building the airfield they used to bomb targets on the Japanese home islands. Cynkar spent his last eight months on hospital ships and in hospitals in New Zealand and California. 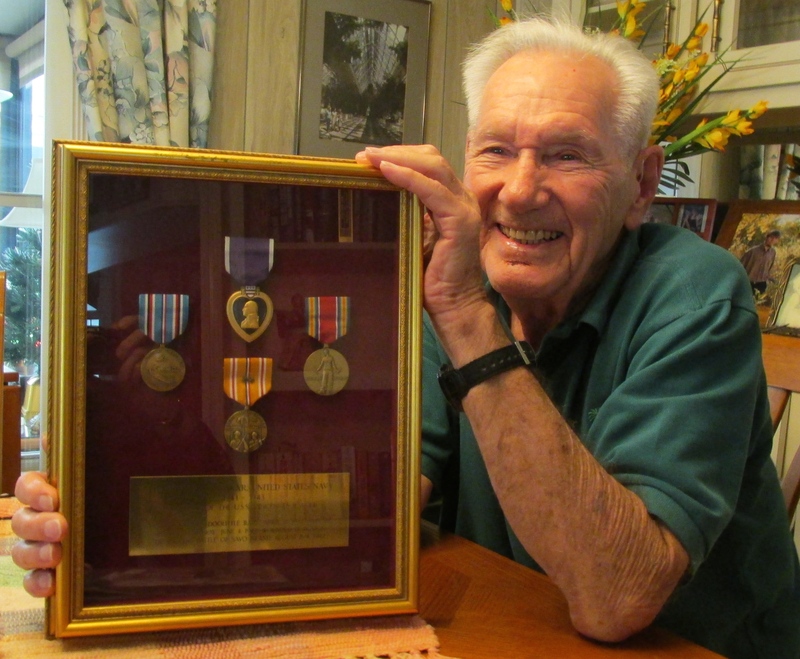 He was discharged from the Navy on Jan. 1, 1943. He was only 17. 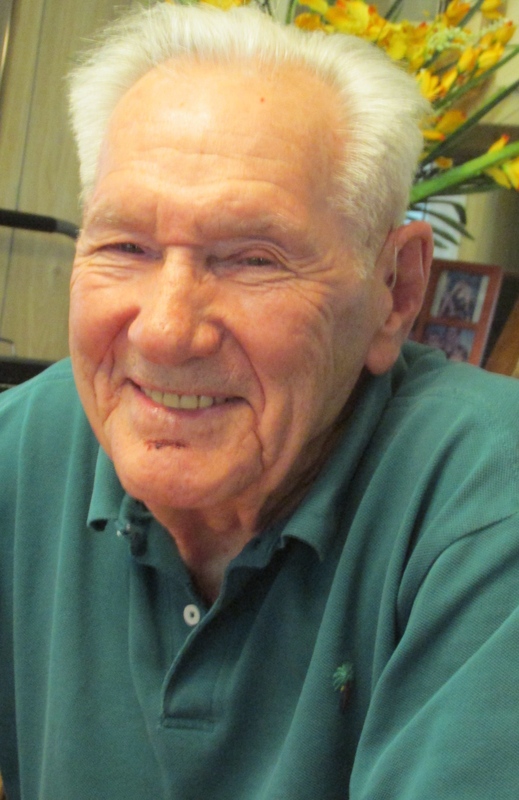 For the next 40 years he worked for the post office in Pittsburgh. 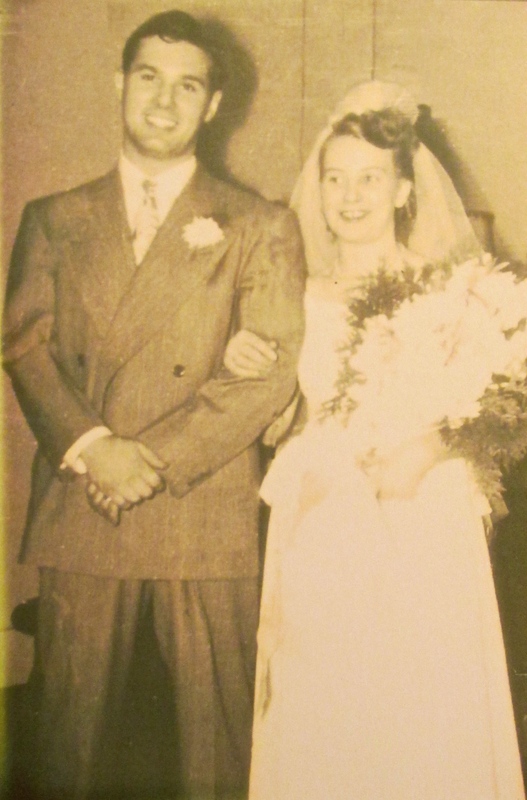 After his wife, Norma Jean died, he moved to Port Charlotte in 1981. The couple has five children: Barbara, Paul, John, Betsy, and Tom. This story was first published in the Charlotte Sun newspaper, Port Charlotte, Fla. on Monday, January 5, 2015 and is republished with permission. Click here to view Cynkar’s collection in the Library of Congress. My grandmother’s brother was on the USS Vincennes when it was sunk & died. He went below deck to help others and that was the final time he was seen. He was only 17 years old. My grand uncle’s name was John Thomas (J.T.) Tucker. Thank you Mr. Cynkar for sharing your experience and thank you for your service.